Below you will find the answers to many of the most common questions we are asked. If, however, you have not found the answer you are looking for, either here on this page or in the downloadable PDF documents, then please click here for our contact details. Q. What is the Kasbah? Q. Who should stay at the Kasbah? Q. Do you arrange transfers to and from the Kasbah? Q. What is the Azzaden Trekking Lodge? Why was it built? Q. What is the trek to the Azzaden Trekking Lodge like? Q. What is Dar Imlil like? Q. What are the GPS coordinates for the Kasbah and the Lodge? Q. What communal facilities do you have at the Kasbah? Q. What can we do there? Q. I want to do a day trek. Do I have to book in advance? Q. What trekking gear will I need? Q. What is included in the price of a days trek? Q. What is included in the overnight trekking price? Q. What is included in the Toubkal summit trekking price? Q. What type of food is available? Q. Is the water at the Kasbah safe to drink? Q. Is the Kasbah licensed? Q. What currency should I take to Morocco? Q. What methods of payment are accepted at the Kasbah? Q. Should I tip at the Kasbah and elsewhere? Q. Is is safe to travel to Morocco? Q. Are there mosquitoes and flies? Q. What is there to do in Imlil village? Q. What is the time now in Morocco? Q. Can I bring a drone to Morocco? We can arrange transfers to and from the Kasbah from Marrakech and other locations. These are arranged directly with the Kasbah. On confirmation of your reservation with us we will send you a transfer request sheet for completion. Transfers to and from Marrakech cost €85 (euros) per car per transfer and can take 3 to 4 passengers. It takes about 90 minutes. Cost of other transfers will be marked on the sheet. Our guaranteed check-in time is 2 p.m. although generally the rooms are ready well before this. You are welcome to arrive before this and you will be given access to your room as soon as it is ready. Check out is by 11.00 a.m. You are welcome to stay on using the Kasbah communal facilities after you have checked out of your room. Perhaps have lunch before returning to Marrakech – some people even go for a days trek before transferring on. The building of the Kasbah’s first remote trekking lodge is the start of a new concept in trekking in the Atlas and now allows guests to stay right in the heart of the spectacular Atlas Mountains without having to compromise on accommodation. The first of the lodges has been built in the village of Id Issa in the Azzaden valley and is a half/full days trek (depending on route) from the Kasbah du Toubkal. The valley of Azzaden is truly spectacular and very traditional. Strong walkers can complete the trek in about 3 and half hours people taking it more leisurely in 4 to 5 hours. We recommend setting off leisurely from the Kasbah between 10.00 and 11.00 hrs and having a picnic lunch near the col at 2200 metres and then descending to the Lodge. Even you want to make the walk longer just ask you guide and he can put in an extra loop. You can return to the Kasbah via a different route which will make a circular tour. Dar Imlil is owned by Abdul (our deputy manager at the Kasbah) brother of Hajj Maurice the Kasbah manager. We have been able to ensure that the build quality and fixtures and fittings are of a similar standard to the Kasbah and it is managed to a similar standard working with the local community as an integral part of its ethos. We have consciously decided against building a swimming pool we believe a swimming pool with people sunbathing next to it is culturally inappropriate due the location of the Kasbah and its closeness to the Berber villages and Berber community. 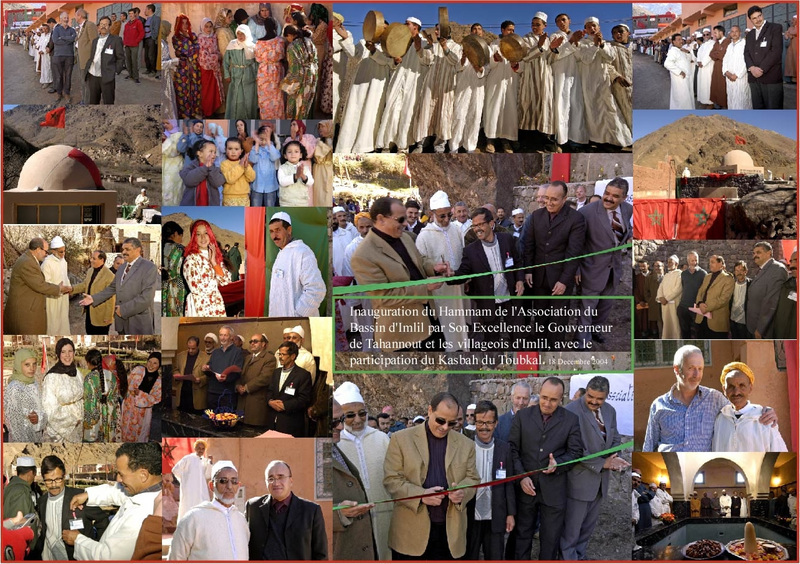 We never set out to build a conventional hotel and like to refer to the Kasbah as a Berber Hospitality Centre. The need for a swimming pool is not huge as we are at 1800 metres and even in summer the air temperature is reasonable unlike Marrakech. There is a plunge pool in the hammam complex and of course, for those with young children, there is the river where in summer the Berber boys in particular do dam the river and splash about…a lot more fun for those with children. Day Treks do not need to be booked in advance in fact they are best booked the night before directly with the Kasbah when you are there. All treks are arranged with your own personal guide and can be tailored to your own specific needs. The arrangements will be made locally and you would need to discuss the route, your expectations and your fitness levels (the walk up to the kasbah will give you a good indication!) when you are at the Kasbah – they will take this into account and also the weather etc. Also, you can hire an extra mule or two of you fancy riding part of the way. The most important is to have a good pair of walking shoes or boots for longer more strenuous walks that give good ankle support. Walking boots are recommended but many people trek the Atlas in trainers during the summer months. Ideally you should have a set of waterproofs (yes, even in summer) and these can be borrowed from the kasbah if required. A half day trek is up to 4 hours walking with a mountain guide – either morning or afternoon but it cannot overlap as a full day will need to be charged. Full day treks include a substantial picnic lunch in the country and you will be accompanied by a guide and mule support to carry the lunch. All your food, drink and bedding requirements are covered in our prices. You will be accompanied by a mountain guide and have a mule and cook with you during your say. You have a private team of least 2 people. This is a private expedition with a minimum team of 2 people (guide and muleteer) and a mule to look after you. It is fully inclusive of everything you will need but you need to bring your own walking boots and ideally your own waterproofs but these can be borrowed if required. See full information sheet for details. Our management style has been to consciously avoid the appointment of “expat” cooks or others and instead have tried to provide the maximum amount of employment including management to the local community. In the food department this has meant taking competent local cooks and training them and allowing them to develop – we try to improve their offering and aim to offer good wholesome local Berber cooking. We are happy to cater for vegetarians and would suggest that you mention that you are vegetarian to our staff on arrival and they will discuss with you what you would like to eat. Vegetarianism, as in France, is not well understood in Morocco and sometimes cooks will be very happy to have suggestions from you what you might like to eat. They will try their best to please. Meals cost €15 (euros) for Lunch and €20 (euros) for evening meals. The cold water supply for the Kasbah comes from a spring. This has been tested and the analysis is displayed on the notice board in the reception area. The water analysis shows that this supply is drinkable. As a further precaution all of the water in the kitchen, both in the main Kasbah and Garden House, flows through a UV filter and is used in the water jugs that we put on the tables at meal time. The analysis after the filter is also displayed on the board. If you wish to fill up a water bottle for walks etc, please ask our staff to fill it in the kitchen. In keeping with our sustainable policy, we accordingly do not encourage the consumption of plastic mineral water bottles at the Kasbah, however these are available for those that prefer. The Kasbah does not have an alcohol license. However, guests staying at the Kasbah are welcome to bring their own alcoholic drinks, which they should purchase prior to leaving Marrakech. There are several shops in the Gueliz area of Marrakech that sell alcohol. In deference to local custom, we ask that alcohol be consumed discreetly. We have agreed that whilst Omar and Arkia are happy that our guests drink alcohol we will respect their views on it and not ask that they or their Berber staff serve it to us. From an environmental point we ask that you take the empties away with you – they will at least be lighter! The Moroccan Dirham—approximately 12 to the pound and 11 to the Euro—is a restricted currency and cannot be legally purchased outside of Morocco nor can it be exported. So you have get your local currency when you arrive in Morocco. There is no black market in the currency. You can generally rely on debit and credit cards and use the ATM which are all over Marrakech to withdraw Dirhams when needed; large hotels can usually change money. There is a small bureau de change at Marrakech airport where it is usually advisable to get a few Dirhams on arrival. For those that wish, there is a central gratuities box at the kasbah which will be shared out amongst the Kasbah staff. Elsewhere in Morocco, tipping that takes place in most other countries is appreciated. In restaurants 10% is probably considered on the generous side of things many people tip this sort of amount and quite a few do not! If you have been with a driver or guide for several days and you have been pleased with his work a tip of about 100DH to 150DH or so per day is something that would be very welcome. Hopefully the attitude of the Kasbah staff is that they are very pleased to be given gratuities, but they are paid to do their job well and it should be considered an extra for good service. If only we knew. Increasingly over the last few years the weather has seemed to be less reliable and extremes of weather can take place almost at all times. Morocco was described in Michael Palin’s Sahara as a “cold country with a hot sun”. This is not a bad generalization for much of the year (apart from probably the summer months when almost everywhere except the mountains and coast is hot to very hot) and if you are unlucky, and the sun is in, you need to be prepared. Having said that Morocco has a huge number of sunny days and even in winter warm sunny days are the norm. You should definitely take some warm clothing even if visiting during the summer months. The evenings can cool off once the sun goes down. The higher you go the cooler it will be. Some historical temperatures and rain statistics for the Kasbah can be seen by visiting the weather page. Imlil village is a the road head for alot of the trekking that takes in the Atlas Mountains and is on the main route to Jbel Toubkal. It has always been an important tourist village in a rural setting. This has become even more so since the building of the tarmac road and better communications. There are several shops selling tourist souvenirs as well as grocery shops selling food to the locals. There are several basic cafés offering some local food. In the evenings, however, the village shuts up early and there is little or no alternative to eating an evening meal at the Kasbah. We ask that this number is not used as a general contact for guests staying at the Kasbah but only in emergencies. There are no telephones available in the Kasbah for guests general use. However, a telephone is available in the teleboutique outside the Kasbah. Being a rural area there are reliability issues with the phones at the Kasbah. Sometimes they may appear to be ringing, but in fact they are not – it is not that we ignore them! As of February 2002, mobile phones work at the Kasbah. However, we do request that mobile phones are either turned off or used discreetly and not used in all the public areas including roof terraces. Email services are normally available from Kasbah du Toubkal reception in Imlil village. Visit the Time and Date website for the latest time including information on Daylight Saving Time. Download the 2012 British Embassy PDF document on Ramadan for more information. Since March 2015, drones have been illegal in Morocco. Bringing one into the country without declaring it will result in it being confiscated permanently by the customs. Baggage is checked when entering the country AND when leaving. If you declare the drone whilst entering Morocco, the customs may - at their discretion - hold it at the airport until the you leave the country. Special permission is possible for commercial drone use.